Vegetable cooking times can be puzzling. With certain vegetables it's easy to assess the cooking time but others require definite timing to get the optimum results. 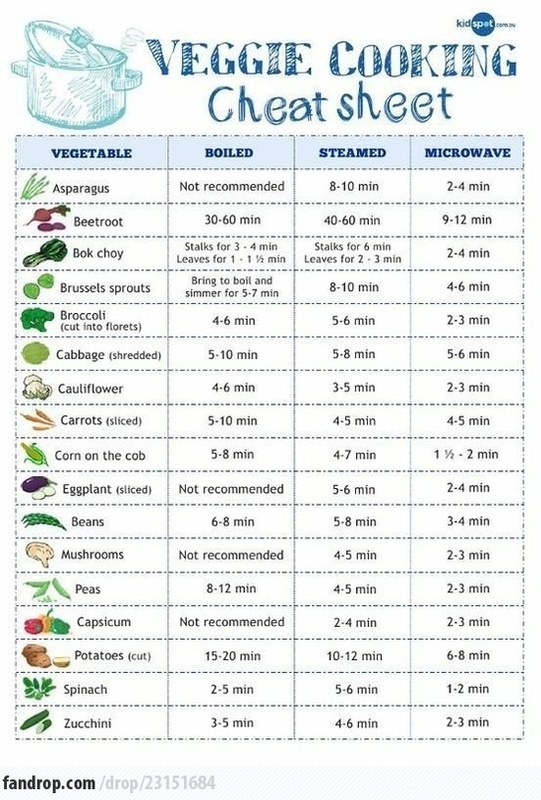 Fortunately, this cheat sheet from Fan Drop sets out some tips for cooking a range of different vegetables. It offers vegetable cooking times for boiling, steaming and even the microwave - although we usually avoid nuking our veg at FDL HQ. Since the infographic focuses on methods that don't require added fat you won't find cooking times for roasted or sautéed veggies. But this is still a wonderful resource you may want to consult often. To ensure green beans are cooked just right (bright green but with a slight crunch) we have to consider the method we want to use. If you love asparagus but are not quite sure how to cook them, here's some advice to get it right every time. Click here for our delicous asparagus recipes. Remember that cooking times for beets will greatly vary depending on whether you choose to steam, boil or microwave these brightly colored root veggies. Find a whole array of beet recipes here. Savoy cabbage, also known as Chinese cabbage, is thinner and lighter than traditional green cabbage. You'll want to cook it so it still retains its crunch. Broccoli is among the most versatile vegetables in the kitchen. Cooking times are relatively short which makes it nice for weeknight dinners. Give these stellar broccoli recipes a try. Boiled: bring to a boil then simmer for 5-7 min. You'll love these flavorful cauliflower recipes. Try all of our carrot recipes. Discover dozens of ways to cook eggplant. Click here for wonderful mushroom recipes. Click here for tempting pea recipes. Learn the many ways to cook peppers. Find our favorite potato recipes here. Click here for versatile spinach recipes.